I really like yogurt and I could not conceive a breakfast without a good amount of yogurt mixed with fresh fruit or fruit salad. And the yogurt that I find here, produced by small local consortia is extremely good, suitable for almost all uses, but ... every so often I get the the thick yogurt nostalgia that I find the summer holiday: the greek strained yogurt. Clearly on the supermarket counters here are some great local imitations; but it is not the same thing, and so, when I find the original (albeit industrial), now I take a jar to use as starter In preparation at home in quantities! 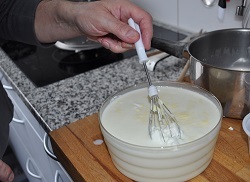 Heat in a pan the milk and cream, without boiling. Let cool to ca. 40 °, pour into a fairly large bowl and gently mix the yogurt, already at room temperature, milk, causing him to dissolve as much as possible. Cover it with a cloth or a non-airtight lid (such as a plate resting on the bowl) and allow to ferment for eight hours at a constant temperature between the 35 and 40 ° ° (absolutely no more). I leave for the night in the oven on a function "leavening" in 35 °. But it also goes very well the oven with the light on! He spent eight hours lasciarl cool and then pour it in a perforated container containing a gauze or a special cloth to filter. Wait a couple of hours; yogurt will lose about half of its volume. At this point, put it in one or more sealed containers and store it for use in refrigerator (from me does not last long, in less than three days, at times, has already been done off ...). The last 100 / 125 grams can be used to trigger a new round of yogurt. I wanted to include this recipe in the dessert, and not in the basic preparations, because to me the yogurt is a great dessert! if you have a yogurt you can use a bowl instead of vasettini endowment and in this case it is not necessary to heat the milk first. if someone has some problems in line opposite to mine, it is possible to eliminate the cream and, even if reluctantly, use a semi-skimmed milk!